Theresa May's premiership is the focus for many of the newspapers following her return from what the Telegraph calls her "Brussels failure". "PM loses her grip on power" is the front page headline in the i newspaper. Both the Times and the Telegraph leader columns urge Theresa May to quit. 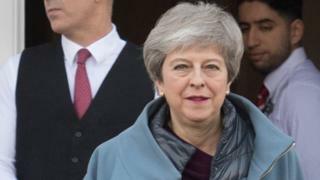 In an editorial headlined "Go, Prime Minister", the Times says one conclusion is inescapable: Not only does Mrs May have no solution to the political crisis that is engulfing Britain, but she has become an obstacle to finding a way out. The Telegraph says she will no doubt spend this weekend contemplating both the country's future and her own. It goes on to praise her lifetime of service to the country, but adds that the multiple meanings of duty can include recognising when things can go no further. Away from Brexit, the Times reports that weapons similar to those used by the Christchurch mass murderer are legally on sale in Britain, despite the government's claim that gun laws are the toughest in the world. According to the paper, semi-automatic shotguns can be bought online and from gun dealers around the country. It says these combat-style shotguns fire cartridges, but can be fitted with magazines holding up to 10 rounds that can be discharged rapidly without any need to reload. The Home Office tells the paper it will review the findings of the inquiry into the New Zealand attacks, to see if further action should be taken here. Finally, the Mail reports that the owner of a chain of pubs could be about to ban mobile phones at his establishments. According to the paper, Humphrey Smith - who owns Samuel Smith's brewery - has apparently told staff to actively discourage drinkers from using phones or tablet computers, in an attempt to preserve the genial art of pub conversation. The paper says that at one of the brewery's 300 pubs, a ban already appears to be in place. When the paper's reporter attempted to use a tablet computer, a member of staff told him he could not do so "because Mr Smith doesn't like it". The paper says it was told by Mr Smith's office that there wouldn't be any comment.